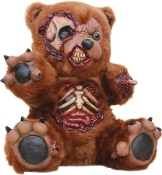 This Bad Teddy Bear got into a little trouble, violently attacked by the zombie virus and is now amongst the walking dead! This grossly disfigured 13-inch tall creepy stuffed latex disturbing horror prop has a grotesque appearance, with skull fur and torso parts torn away, and dismembered appendages exposing the gross bloody bone stumps underneath. Makes a spooky freakish centerpiece for table or entryway, surrounded with Halloween candy or costume party theme drinks. Bad Teddy foam filled latex prop is highly detailed and is easy to clean off with a damp cloth if it gets dirty. *WARNING: Decoration Only - NOT a KIDS TOY!